This posting may be of limited interest to modelers as the kit seems to be for the most part unavailable in this country. I ordered mine from Hobby Link Japan after reading a review in Scale Aviation Modeling International. After reading a very positive review, and having gotten over my bad experience several years ago with the DML 1/72 version of this kit, I placed an order for both the H0 and H1 versions. On the trees, the parts look very good and generally to scale (I didn’t compare them to any scale drawings). Nicely engraved panel lines. The cockpit is fairly basic with a seat, cockpit tub, instrument panel and control stick There is no engraved work on the instrument panel or side consoles, although there are decals which go on well and look good for these parts. It looks good finished with a set of masking tape seat harnesses. Construction was pretty straight forward. Everything fit well- fuselage halves, wings, wing to fuselage fit, all good. The pitot tube and gun barrels are molded into the wings. I cut them off and reinstalled later since invariably I would have accidentally broken them off during construction. The only fit complaint I had was the cockpit windscreen (you have a choice of open (two- piece) or closed (one-piece)). The parts were quite clear and free from defects. As I was saying, the windscreen did not fit perfectly, and required numerous applications of the old white glue/H2O combination before the seams looked right. The instructions are in Japanese. Thankfully, there are no major construction challenges and I could follow the graphics to see what went where. Well, except for the decals, that is. The diagrams for decal placement are skimpy to say the least. 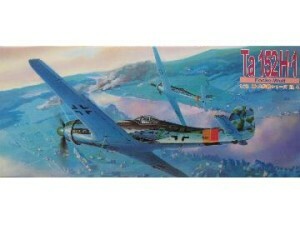 It seems that to save paper and ink, a different aircraft (decals are included to build any one of at least three) is depicted for each view shown. In other words, one aircraft is depicted in one side view, a different one in the other. Additionally, many of the smaller decals on the sheet are not even referenced in the instructions. I finished my H1 in late war RLM 76, 81 and 83. Finished, it looks great. I recommend it for anyone who wants to build this aircraft in 1/72 scale. As an addendum to my review, I would recommend leaving off the external “belly” fuel tank. It looks unlike any German fuel tank I’ve seen, and in fact more like its American counterpart. The attachment points are rather crude do not lend to a good or accurate fit once the tank is in place. Secondly, beware of the decal for the fuselage band. Despite my best efforts, it would not seat properly. I ended up pulling it off, masking off the fuselage area and airbrushing on the appropriate colors.